Sony MDR-AS40EX review | What Hi-Fi? 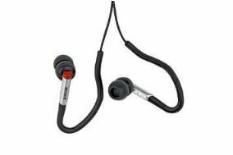 These lightweight Sonys have interchangeable buds and ear hooks to ensure anyone can achieve a solid, comfortable fit. The fixed cord is 0.6m – great for those using an armband sleeve for their MP3 player – but there's also an extension cable. In action they're weighty and clear, if a touch bright at the top.